If you have a function called ƒ, let’s call its inverse ƒ–1 (i.e. ƒ–1 is the inverse function of ƒ). A function ƒ and its inverse ƒ–1. 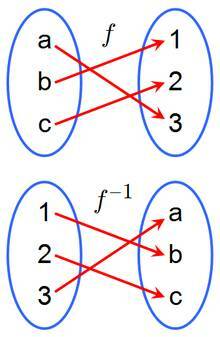 Because ƒ maps a to 3, the inverse ƒ–1 maps 3 back to a. In mathematics, if ƒ is a function from a set A to a set B, then an inverse function for ƒ is a function from B to A, with the property that a round trip from A to B to A (or from B to A to B) returns each element of the initial set to itself. How do I rewrite an equation using function rotation? What is the difference b/w relation and function. It would be great if you could give some real life example. Posted in 10th Grade, Math Answers. This entry was posted on Saturday, September 4th, 2010 at 6:16 am and is filed under 10th Grade, Math Answers. You can follow any responses to this entry through the RSS 2.0 feed. You can leave a response, or trackback from your own site.